To be able to restore critical components related to the OS and start the OS after recovery, you must include in the backup the system volume (volume on which the OS is installed) and the System Reserved/UEFI or other system partitions. To simplify this process, Veeam Agent for Microsoft Windows offers you to add the Operating system component to the backup scope. When you select to back up the operating system data, Veeam Agent for Microsoft Windows automatically includes in the backup all data related to the OS. This mechanism differs depending on the backup type: volume-level backup or file-level backup. 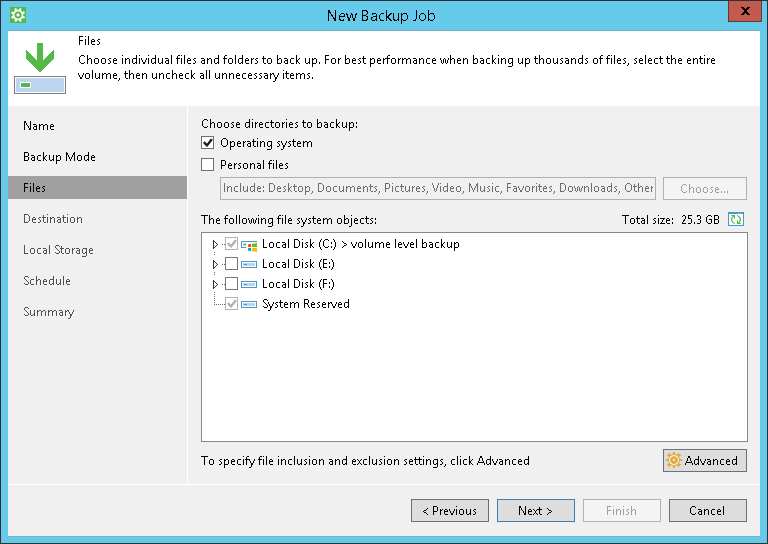 To include the operating system data in the volume-level backup, select Operating system data. When you select to back up the operating system data, Veeam Agent for Microsoft Windows automatically includes in the backup the system volume and the System Reserved partition. If some additional system partitions appear on the Veeam Agent computer in the future, for example, after the OS upgrade, Veeam Agent for Microsoft Windows will add these partitions to the backup scope, too. Alternatively, you can explicitly select to back up the system volume. When you select to back up the system volume, Veeam Agent for Microsoft Windows automatically includes the System Reserved partition in the backup. However, if additional system partitions appear on the Veeam Agent computer, Veeam Agent for Microsoft Windows may be unable to back up such volumes. Thus, it is recommended that you use the Operating system option to create system state data backup. To include the operating system data in the file-level backup, select Operating system data. When you select to back up the operating system data, Veeam Agent for Microsoft Windows automatically includes in the backup all data related to the OS: the system volume, personal files and the System Reserved partition. 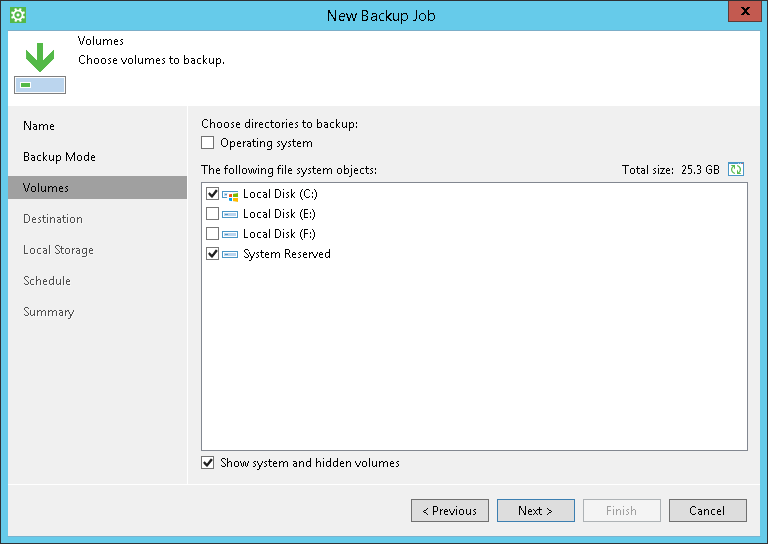 Alternatively, you can select to back up the system volume and the System Reserved partition. In this case, you will be able to exclude specific folders related to the OS from the backup (for example, the Users folder and Documents and Settings folder). When you select to back up the Operating system data, you cannot choose which components related to the OS must be backed up and which must be excluded.